Join 9-year-old Mt. Laurel residents Courtney and Sabrina in April when they set up lemonade stands to raise money for the Alex’s Lemonade Stand Foundation. Sabrina and Courtney were recently challenged to make a difference in their community by their third-grade GAP teacher Mrs. Kuchera at Springville Elementary. In class, they learned how one child could make a big difference, and the girl they most admired was Alex from Alex’s Lemonade Stand. Alex’s Lemonade Stand was originally started by Alexandra “Alex” Scott, who died of cancer in 2004 at the age of 8. On her first birthday, she was diagnosed with neuroblastoma, and once she reached the age of 2, Alex could finally crawl and stand with her leg braces. Even though she wanted to help herself, she wanted to help others with cancer as well. Courtney and Sabrina ask the community for help in making Alex’s dream come true one cup at a time. 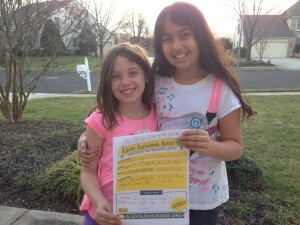 Donations are also accepted at the webpages Courtney and Sabrina created through the foundation at www.alexslemonade.org/ mypage/1220735 or www.alexslemonade.org/mypage/1220968.